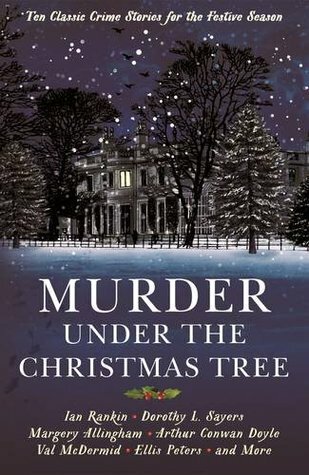 Murder Under the Christmas Tree contains ten stories by a variety of crime authors, all with a Christmas theme or set during the festive period. I don’t often choose to read short story collections (although I seem to have read more of them this year than ever before, so maybe that is beginning to change) but I picked this one up in the library a few weeks ago because I was intrigued by the mixture of authors – some modern, some classic, some that I was familiar with and some that I wasn’t. I’m never sure of the best way to write about books like this, but as there are only ten stories I think I should be able to give all of them a brief mention. The book opens with The Necklace of Pearls, a Lord Peter Wimsey mystery by Dorothy L. Sayers, one of the five authors in the collection I had read before. The story involves a search for a valuable pearl necklace which goes missing as a party of guests gather to celebrate Christmas. I always like Sayers’ writing, but this particular story is not very strong and not a great start to the book, in my opinion. It is followed by The Name on the Window by Edmund Crispin, a locked room mystery set in winter and featuring his detective Gervase Fen. Crispin is another author I have previously read – I highly recommend The Moving Toyshop if you haven’t read it yet – and again, this story is not the best example of his work but it’s still enjoyable and I didn’t guess the solution. Now we come to one of the authors who were new to me: Val McDermid. Yes, there are some huge gaps in my reading when it comes to more recent crime fiction! A Traditional Christmas is a short and simple murder mystery with a nice twist at the end. I really liked this one, although it felt odd coming straight after Sayers and Crispin – especially as the next story is an even older one: The Adventure of the Blue Carbuncle by Arthur Conan Doyle. This is a classic Sherlock Holmes mystery involving a Christmas goose and a precious jewel. I feel sure I must have read it before, but I couldn’t remember it at all! The Invisible Man is next: a Father Brown mystery by GK Chesterton. I first encountered Father Brown in a British Library Crime Classics anthology I read earlier this year (Miraculous Mysteries), but I enjoyed this story much more than that one. It made me think about the things we never notice and the things that we do! This is followed by another modern story, Cinders by Ian Rankin. During rehearsals for a performance of Cinderella, the Fairy Godmother is found dead and Rankin’s detective Rebus is called in to investigate. I have never read anything by Ian Rankin before and although there was nothing wrong with this story, I don’t think he’s an author for me. The next two stories are my favourites. The first, Death on the Air by Ngaio Marsh, is a fascinating story set during the early days of radio. On Christmas morning, ‘Septimus Tonks was found dead beside his wireless set’, presumably having been electrocuted – but was it an accident or was it murder? This is my first introduction to Marsh’s work, but I would love to read more. The next story, Persons or Things Unknown, is by Carter Dickson, a pseudonym of John Dickson Carr. A host entertains his house guests with an atmospheric tale of murder set in the 17th century. I loved it – and again, I will be looking for more by this author. The penultimate story in the book is Margery Allingham’s The Case is Altered. It’s an Albert Campion mystery and while I had hoped it would be one of the highlights of the book, I found it quite forgettable. The last story, The Price of Light by Ellis Peters, was good but felt out of place in this collection, being a Brother Cadfael mystery set in 1135. I’ve never read anything by Peters before and I liked this enough to want to try one of her full-length Cadfael novels. This is an uneven collection, then, and I don’t think the mixture of Golden Age, historical and contemporary mysteries really worked. I’m pleased I read it, though, if only because it has given me my first taste of Ngaio Marsh, John Dickson Carr and Ellis Peters. Another book in this series, Murder on Christmas Eve, also edited by Cecily Gayford, has just been published and seems to include many of the same authors. If you do go on and read any of the Cadfael novels go for one of the early ones. Peters becomes more formulaic as the series progresses. Thanks for the advice. I do usually prefer to start with the first book in a series if possible. I don’t read a lot of short stories either, though the Crime Classics series has proved an exception. I still have Miraculous Mysteries to read, as well as Crimson Snow (a winter but not Christmas collection). I haven’t really been impressed with any of Dorothy Sayers’ short stories. Miraculous Mysteries is the only one of the BLCC short story collections I’ve read so far, but the others all sound very tempting too, including Crimson Snow. I nearly bought this book last week, but decided not to as I have several Christmassy books set aside already. Still I do like the sound of it.These kinds of collections can be a bit uneven though. I don’t read a lot of Christmassy books so I enjoyed dipping into this one. Rankin works better at novel length rather than in his short stories, in my humble opinion. (I recently read his omnibus volume of them and was far less impressed than I’d anticipated.) If you do decide to go further with him, his first two or three Rebus novels are a bit rough — he was learning on the job — but thereafter they tend to be pretty splendid up to Exit Music. Rebus then took a break, and the more recent ones seem a bit lighter — still enjoyable, but less affecting. I envy you having all of John Dickson Carr ahead of you! Thanks – I wasn’t very impressed with the Rankin story in this book, but maybe I should give him another chance and try one of the Rebus novels. I did love the John Dickson Carr story, though, and am looking forward to exploring the rest of his work! Carr’s books can be a bit variable. Here’s a useful discussion of some of them, with links, at a site that very often discusses Carr’s work. Thank you. That will be very helpful when I do get round to looking for more of his work. I’ve been interested in trying a Cadfael novel for years, so maybe now that I’ve had a small taste with this short story I’ll get round to picking one up in 2018! Thanks Helen. This looks like just the thing to have on hand over Christmas. Something short and engaging to dip into between the grandchildren and the socializing. I jumped online and requested it from the library. I hope you enjoy it. This sort of book is perfect for the Christmas period, I think. Of these I’ve only read The Name on the Window, which I found unbelievable. But I generally like McDermid. A lot of her work is awfully dark, though. I’ll think about trying something else by McDermid next time I’m in the mood for some contemporary crime. She has one really great one called A Place of Execution. She tends to be uneven. I love a lot of her books and don’t love almost as many. Like Ali, I almost brought this one a few days back. But now,I am thinking, I will wait it out a bit! Thank You for another excellent review! I did like most of the stories in this book, although the collection felt uneven overall. I hope you enjoy it if you do decide to buy it. I read this book at this time last year and was really disappointed with the Sayers story and on reflection it would have been better if the collection had been either all vintage or all contemporary authors. Yes, I thought the Sayers story was disappointing – one of the weakest in the book. Even though the mixture of Golden Age, historical and contemporary mysteries didn’t really work for you, I do like the idea of a Christmas collection of short crime stories, especially as there are many authors here I haven’t tried either. I think these collections are a great way to try new authors without committing to a longer book.